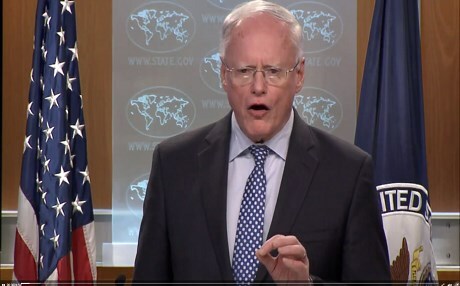 ERBIL, Kurdistan Region — US Special Representative for Syria Engagement James Jeffrey urged other countries to share a larger burden in facilitating the conditions for peace in Syria, while floating the idea of the United Nations enforcing a no-fly zone for parts of Syria. "Remember we were present not in northern Iraq but over northern Iraq in Operation Northern Watch for 13 years. That can be a UN force," he said on Tuesday, referring to the joint US-UK-Turkey no-fly zone in the late 1990s that protected Kurdish areas from the air force of Saddam Hussein. Jeffrey briefed reporters in Washington, D.C., after meeting with the "small group" for Syria — an informal group of European states – Germany, France, and Britain – and Middle Eastern states – Saudi Arabia, Jordan, and Egypt. He said a "UN force" or others could play a role in such an endeavor. "That can be a UN force. Under 2254 there is language on a UN-managed and operated ceasefire. That can be partner forces. That can be other countries’ forces," he said. The US presence in Syria is without a direct UN mandate. Washington argues that its presence was necessitated to protect the sovereignty of Iraq when ISIS threatened to overrun the country in 2014. Washington has maintained that its presence in Syria is solely to defeat ISIS, but Jeffrey indicated that if needed the presence could be through various aforementioned options. "When we say we’re going to be present not forever in Syria but present until our conditions – enduring defeat of ISIL, as was said earlier, the withdrawal of all Iranian-commanded forces from the entirety of Syria, and an irreversible political process," he said. The US-led international anti-ISIS coalition has primarily been supporting the Syrian Democratic Forces (SDF) in clearing operations in the Hajin pocket. The area is in eastern Deir ez-Zor province near where the Euphrates crosses into Iraq. "They are involved in a very, very tough battle. This is not an organization that has been totally destroyed. We think that we’ll be able to finish the job in the months ahead, but there’s very heavy fighting there..." Jeffrey said. He acknowledged the Syrian regime has been conducting "limited" operations against ISIS in southwest Syria. "So apart from that there hasn’t been much military activity," Jeffrey detailed. He dismissed the Russian argument that the United States is playing the "Kurdish card." The mostly-Kurdish Peoples' Protection Units (YPG) has formed the backbone of the SDF. "Russia is playing a dangerous game accusing us of playing a dangerous game. We are totally committed to defeating Daesh along the Euphrates," he said. The head of the Syrian opposition High Negotiations Committee (HNC) Nasr al-Hariri also attended. Jeffrey is not satisfied with the progress of the Astana talks for Syria by Turkey, Russia, and Iran. "But they did not take any significant action on the constitutional committee," he said. After ending the Obama Administration's covert operations to overthrow Assad, the Trump Administration Washington would like to see a new UN-backed Syrian constitution and free and fair elections. "That will be the key point where we see whether we are going to have the political process moving forward under the UN, facilitated perhaps by the Astana guarantors putting pressure on Damascus, or whether we’re going to be in another stalemate..." Jeffrey said. The Syrian conflict began in 2011. Estimates have put the death toll around 400,000.